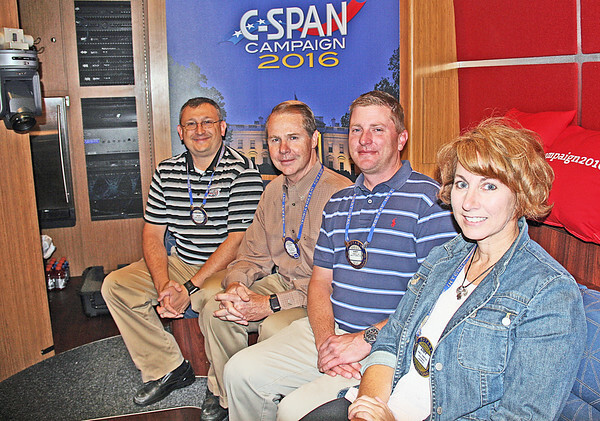 ROTARIAN TOUR: Zionsville Rotary Club President Marc Mitalski (far left), club directors Ron Martin and Andrew Liss, and treasurer Amy Smith were shown around the C-SPAN tour bus on Thursday morning at Zionsville High School. The bus is on the road 11 months out of the year, following candidates and campaign trails. It stopped to visit the club and give its members a tour before making its way to cover the presidential debates later this month. The club members are seated where C-SPAN's interviews are broadcasted live or recorded. "They use the bus as an education tool," Mitalski said. "They talked about their perspective on how they cover politics. It was pretty interesting."